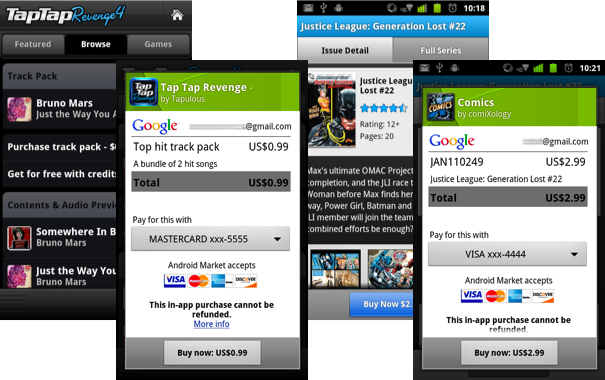 Along with the launch of Tap Tap Revenge 4 comes the activation of in-app billing for the first time on Android. In-app billing allows developers to sell virtual goods from within their apps or even provide users with the option to upgrade from a free to paid version. In Tap Tap Revenge’s case, users will now have the ability to purchase extra songs to battle it out with. The hope here, is that more developers will look to Android as a legitimate mobile platform that they can make a living from, which in turn should give us better apps in the long run. Several other apps are now taking advantage of in-app billing as well: Comics by ComiXology, Gun Bros, Deer Hunter Challenge HD, WSOP3, and Dungeon Defenders: FW Deluxe.